Only 29% of employed Millennials are engaged at work. A full 87% of Millennials say professional development or career growth opportunities are very important to them in a job. These two critical findings come from the wide-ranging Gallup 2016 research report: “How Millennials Want to Work and Live” which took an in-depth look at what defines the millennial generation as employees, people and consumers. The disturbing news is that Millennials struggle to find good jobs that engage them and they have the highest rates of unemployment and underemployment in the U.S. On the other hand, Millennials are a largely optimistic group, and they believe that life and work should be worthwhile and have meaning. They want to learn and grow. When 87% of Millennials say professional development is very important to them in a job, you have got to wonder why so many organizations fail to engage these employees. The answer to the question posed above lies in what has been called the #1 problem facing organizations today: the manager’s inability to coach. Coaching has long been known to be one of the best ways to develop people. In fact, coaching by definition is about listening and asking questions to develop people to find their own best answer to workplace challenges. Unfortunately only about 10-15% of leaders and managers have been taught the skill of coaching, which means that the vast majority of bosses simply do not know how to develop their people. Instead, they resort to telling people how to solve problems rather than helping workers develop their thinking and approaches to solve their own dilemmas. This lack of coaching skill is especially damaging when it comes to holding meaningful conversations with an employee about their career. 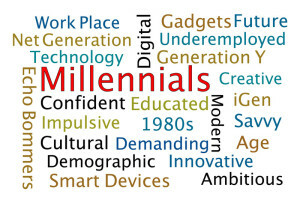 The Gallup study found that: “Millennials want to understand how they fit in with their jobs, teams and companies. They look for work that fuels their sense of purpose and makes them feel important.” The best and perhaps only way to effectively accomplish that is to take a coaching approach to career conversations, helping an employee discover how their strengths, values and passions fit with their job as well as their skills and abilities. Closing the distance between the millennial opportunity and current engagement gap will only happen when senior leaders coach and develop their teams and hold their teams accountable for coaching and developing their people. When this happens, you can create a culture of coaching that is not only engaging to Millennials, but also more satisfying for their Gen X and Baby Boomer bosses. This is the reason why so much of our work at Leadership Beyond Limits is currently focused on helping managers become leaders by learning how to coach. Coaching is not a difficult skill to learn, but it is a leadership skill that must be developed and practiced if your goal is to have an engaged workforce. With Millennials now making up the majority of the global workforce, taking a coach approach to leading and developing your people has never been more important.